In case you are wondering what this is all about, let me explain, or narrate please. They say an act of kindness never goes waste, no matter how small. I believe this to be very true. So it was my first day at this hotel in Rochester and I had just finished my breakfast. Before leaving for work I went to my room to pick up by office bag. There was this charming lady, who was cleaning my room. She greeted me with the customary Good Morning and a big smile. She seemed of South Asian descent, and on my asking told me she was from Ceylon. So I was just putting some things in my bag and I asked her how many kids she has. She told me she had two kids one was just few months old and the other a few years. She also told me her husband had a stroke and was hospitalized. That seemed bad to me. I was just heading out and instinctively drew a $ 10 bill and gave it to her, saying, “Its for your kids.” Reluctantly Shanti accepted it, as usual with a big smile. I gave an inward smile to myself thinking I had made someone’s day. It’s a great feeling you get when you help someone. The next day I forgot to put the “make my room” sign. The day after when I returned from work, I saw this small neat note written by her laying on my pillow. 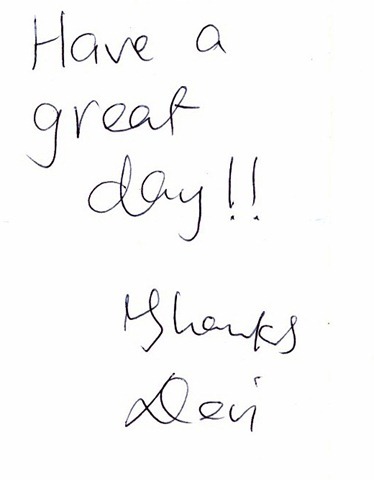 It read, “Have a great day, Thanks Devi.” That, just made my day. To this day I remember Shanti. And my belief has grown even stronger, an act of kindness never goes waste.